The No. 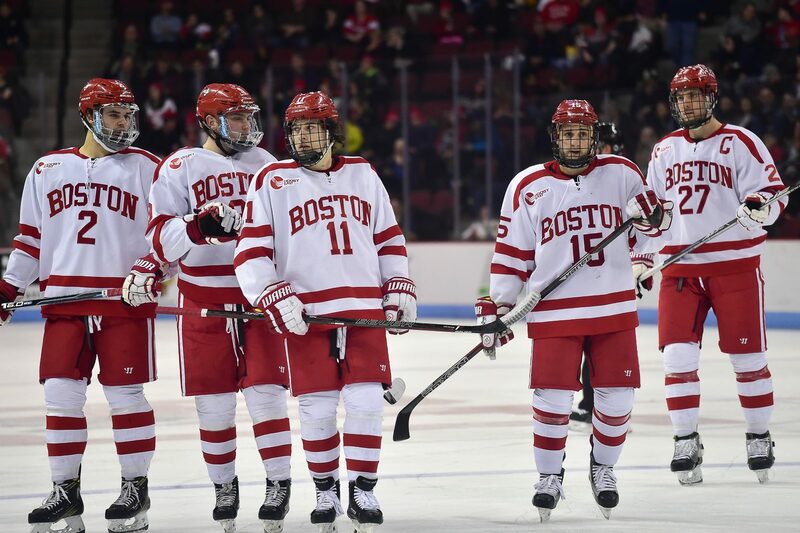 3 Boston University men’s hockey team handily advanced to the Hockey East Tournament semifinals with a 5-0 win over Merrimack College on Saturday, sealing the quarterfinal series sweep and a trip to TD Garden next weekend. Junior goaltender Matt O’Connor has been solid in net all season for BU, and had yet another stellar performance on Saturday. He turned away 26 Merrimack shots, including 15 saves in the second period, playing 58:58 of shutout hockey. He even recorded an assist in the game, passing the puck up to freshman forward Jack Eichel during a penalty kill on senior assistant captain Cason Hohmann’s shorthanded goal at 4:11 in the second period. O’Connor was pulled with 1:02 remaining in the game on the brink of the second shutout of his career, however, because there were more important matters to tend to. When BU held a 4-0 advantage with a little more than a minute remaining, it was clear that it would be the last game of the season at Agganis Arena. A third game to determine the series winner between BU and Merrimack wouldn’t be necessary, so all games would be played at a neutral site from there on out. For several Terriers, it would be their last time ever touching the Agganis Arena ice for a game — including graduate student goaltender Anthony Moccia. 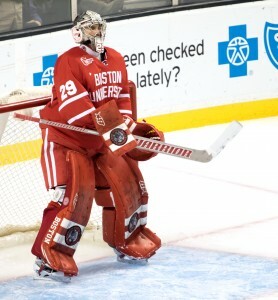 BU head coach David Quinn acknowledged that and gave Moccia some time in net for his final game at Agganis. “At the end of the day, Moccia’s going to remember that for the rest of his life,” Quinn said. “OC I’m sure would’ve loved to have the shutout, but that moment’s going to mean a lot to Moccia than O’Connor finishing the last minute and a half of that game. Was O’Connor fine with the decision? Moccia entered the game when Merrimack had a 6-on-4 man advantage, but stood on his head, even recording a save — the third of his career in just more than 10 total career minutes — to hold Merrimack scoreless in the game. Like Friday night, BU played shorthanded on defense, with just five players available due to upper-body injuries to freshman John MacLeod and sophomore T.J. Ryan. But that posed no trouble for BU’s blue liners. Sophomore Doyle Somerby and freshman Brandon Hickey each had five blocked shots. The team had 16 total in the game. In addition to holding Merrimack to just two shots on goal during the second period, BU got some work in on offense during the game. Junior captain Matt Grzelcyk scored an empty-netter with 4:21 remaining in the game, and freshmen Brandon Fortunato and Brien Diffley each had an assist apiece. For the second straight night, the Terriers were able to swarm the Warriors in the second period, recording three in the second frame on Saturday. Conor has more about the team’s second-period play in his sidebar. At the end of the second period, with BU holding a 3-0 lead over Merrimack, tempers began to fly and a post-whistle scrum broke out. For Merrimack, defenseman Jonathan Lashyn received a roughing penalty and a 10-minute misconduct, and forward Brett Seney received penalties for roughing and cross-checking in addition to a 10-minute misconduct. Hohmann also received a cross-checking penalty and 10-minute misconduct. Sophomore forward Nick Roberto had a roughing call against him in addition to a 10-minute misconduct of his own. In all, each team received 38 penalty minutes in the game – a season-high for BU. The Terriers played a very good game, but it’s a major concern when things start to get so chippy — a suspension or injury caused by fighting or a temper tantrum would be the last thing BU needed entering the Hockey East semifinals. In its first game in two weeks and its first of the Hockey East Tournament, the No. 3 Boston University men’s hockey team beat Merrimack College soundly on Friday night, pushing the Warriors aside to the tune of a 6-2 score at Agganis Arena. With the win, the Terriers put themselves in a position to advance to the conference semifinals if they can grab another victory on Saturday afternoon. And if BU pieces together another performance like the one in the opening game, it’s not unreasonable to think that’s a likely possibility. When a team has the most prolific top line in the country, you can expect a lot of highlight reel goals. And while that was the case for at least one of BU’s tallies on the evening, three of its markers came off second chances near the netmouth. About 14 minutes into the second period, senior assistant captain Evan Rodrigues let a shot fly on goalie Rasmus Tirronen. The netminder made the initial stop, but the puck slid behind him in the crease and sat stationary before freshman center Jack Eichel knocked it in for his first of two goals. Three-and-a-half minutes later, Rodrigues picked up a puck near on the doorstep as well that had come off a rebound and roofed it from in close under the bar. Junior forward Matt Lane gave the Terriers even more insurance as he batted in a second-chance shot as well to extend the lead to 5-1. “For the most part, it was just roll your sleeves up and win a battle along the wall and stay with rebounds at the net front and don’t be denied,” said BU head coach David Quinn. Quinn also noted that he felt his team displayed the grit and toughness required to beat a defensively strong Merrimack team. For much of the year, the Terrier defense’s proclivity for generating shots and making plays has helped power the second-best team offense in the country. Friday night was no different, as four of the five defensemen dressed for BU tallied at least a point. For more on this, read Sarah’s sider. The Terriers looked locked in from the drop of the puck, outshooting Merrimack 18-4 in the first period and out-attempting the Warriors 29-8. By night’s end, BU would post a 46-shot performance and held Merrimack to just 19. The victory also marked the Terriers’ third straight game with at least five goals and second consecutive with six. The half dozen pucks that BU put past Tirronen is even more impressive when you take his .928 save percentage into account. And when Merrimack was outshot in both games it played against Northeastern University last weekend, Tirronen stopped 99 of 102 shots faced, good for a .971 sv%. Before Friday’s game, the Warriors allowed 2.28 goals per game on average, a total that placed them at 13th in the nation. Eichel also pointed out that, with a goalie and defense as stalwart as Merrimack’s, every shot is a good one. Netting six goals isn’t too shabby, either. Although it’s tough to really harp on this considering the Terriers converted on two of their eight chances with the man advantage, Quinn said there was still room for improvement, despite firing 20 shots on Tirronen on the power play. “I didn’t love our power play tonight,” he said. “I know I sound like the grumpy coach, but I thought we kind of slowed it up a little bit. I thought we allowed them to get in shooting lanes, and I was surprised we had 20 shots on the power play, but I think we need to be better. I thought we got a little bit away from doing the things we’ve been doing for the most part all year, thought our pace kind of slowed down a little bit. How to clean up penalties? Young team, how can you be a leader?